Make this stew from my Soups + Sides cookbook in a large, heavy-bottomed stove-to-oven soup pot, such as a Le Creuset. Cut a chuck roast into cubes for a melt-in-your-mouth flavorful beef; if you start with a 3-pound piece, you might end up with about 2 1/2 pounds after the fat is cut out. I like to brown the beef in 2 pots - the soup pot and another large skillet - to get twice the amount of flavorful brown bits left after sautéing. 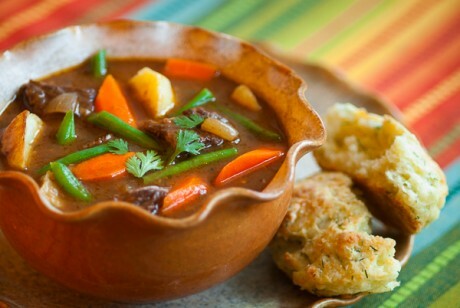 I usually cook the vegetables on the side to get the best texture and then add them to the stew. Preheat the oven to 350°. Sprinkle the beef with salt and pepper. Heat 2 tablespoons of the oil over medium-high heat in a large soup pot (or one soup pot and one large skillet). Brown the beef on all sides in 2 batches; try to avoid overcrowding so beef browns. Set aside. Add onions and sauté about 4 to 5 minutes. Add the garlic and sauté another minute or so. Stir in the flour and cook 1 to 2 minutes, stirring often. Add wine and tomato paste, scraping up any browned bits that may have stuck to pot. Add the stock, bay leaf, Worcestershire sauce and thyme; bring to simmer. Add meat; return to simmer, cover and put in the oven to cook until the beef is fork tender, about 1 1/2 hours. Meanwhile, place the potatoes on a baking sheet, and mix with the remaining 1 tablespoon of oil; add salt to taste. Roast in a 350° oven until tender, about 40 minutes. Place the green beans in the top of a steamer set over boiling water and steam, 4 minutes. Run the beans under cold water to stop the cooking. Steam the carrots for 2 to 3 minutes; then run them under cold water. Just before serving, add the potatoes to the stew and reheat gently. Stir in the carrots, green beans and parsley. Season with additional salt and pepper, if needed.